Purchase at Amazon, B&N, Kobo, iBooks, and Google Play. CAROL KARUSO has made more than her share of mistakes when it comes to picking the men in her life. When one of them, a shady womanizer from her recent past, disappears, she could care less. That is until her best friend guilts her into helping his daughter look for him. Will Carol's developing skills as an investigator be enough to find this lost Romeo before he becomes a dead one? If you fancy thrilling mysteries, especially those that include a beautiful, redheaded detective with bad habits but endless determination, colorful characters, dark villains, and more than a dash of humor, murder and mayhem, you'll love this second book in the Carol Karuso Mystery Trilogy. 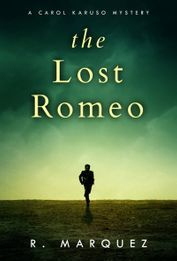 Buy The Lost Romeo today.